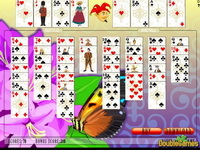 Description: Hone your card skills with the one-suit casual version, practice your techniques on the two-suit normal version, and prepare to take on what is possibly the toughest solitaire game in the world - the full four-suit expert mode! With graded difficulty levels, built in help, stats of your previous games, online high scores, and a host of other options - this is THE ultimate Solitaire game! Instructions: Arrange the cards on the numbered stacks so they form full suits from King down to Ace, and can be removed from play. Cards can only be placed on either an empty stack, or on another card that is one higher in value. The suit doesnt matter, but you can only pick up multiple cards from a stack if they are all of the same suit!